Abstract: Visual search is used in a variety of activities. When modeled experimentally, cued object search tasks can be used to investigate the search strategy humans apply when looking for an object. 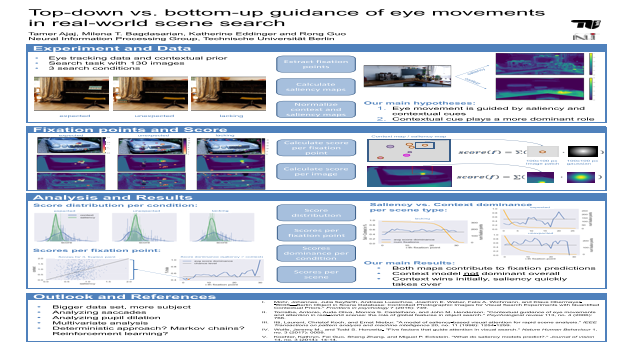 Two of the main factors that influence eye movement during object search are bottom-up processes like the biologically motivated saliency and top-down processes like contextual priors. While recent work focusses on creating unified models, we investigate the degree in which two models influence visual search. In this paper we describe a method that makes individual models comparable which results in a scoring function. We apply this scoring function to bottom-up saliency maps and top-down contextual prior maps and analyze their predictive behavior of fixation points. We show that the first points participants fixate on are influenced by contextual information and once this information does not lead to the finding of the cued object salient information becomes more dominant.Summary: The project aimed to understand how do we search by saccadic targeting and the role of top-down and bottom-up attention modulations. The research hypothesis in this study was that eye movement is dynamically guided by both saliency and contextual cue in real scene saccadic targeting task, but the contextual cue plays a more dominant role. To test this hypothesis, we used computer vision algorithms and statistical models to analyze eye-tracking data from a real-world scene search experiment.References: 1. Mohr, Johannes, Julia Seyfarth, Andreas Lueschow, Joachim E. Weber, Felix A. Wichmann, and Klaus Obermayer. "BOiS—Berlin Object in Scene Database: Controlled Photographic Images for Visual Search Experiments with Quantified Contextual Priors." Frontiers in psychology 7 (2016): 749. 2. Torralba, Antonio, Aude Oliva, Monica S. Castelhano, and John M. Henderson. "Contextual guidance of eye movements and attention in real-world scenes: the role of global features in object search." Psychological review 113, no. 4 (2006): 766. 3. Itti, Laurent, Christof Koch, and Ernst Niebur. "A model of saliency-based visual attention for rapid scene analysis." IEEE Transactions on pattern analysis and machine intelligence 20, no. 11 (1998): 1254-1259. 4. Wolfe, Jeremy M., and Todd S. Horowitz. "Five factors that guide attention in visual search." Nature Human Behaviour 1, no. 3 (2017): 0058.